How brokers make money with binary options? My question may seem naive, but I can’t find for sure the answer. Everywhere how binary options work is explained from the point of view of the trader. How can such a system work if the broker is not also making money ? From my understandings : at no moment any money implied with this transaction is related to the market. I believe it is called an over the counter (OTC) transaction. So, from this angle, that’s very like gambling with a casino, where the broker is the bank and the trader is the player. If my understanding is correct, I find hard to see how binary options can be the next big thing : like in a casino, [B]the trader’s interest is against his broker’s interest. [/B] So if traders are getting better, the broker will have to lower the potential gains or too good traders may even get tossed out :59: ! I know markets works on the same principle that someone’s profit is made of others losses, but the broker is just a proxy, not interfering with his client interest. [B]Am I correct on the mechanism of how binary options transaction work ? Most binary option broker are a scam. They need traders to make a deposit and lose trades in order to make money. For example you place a $100 trade and the payout is 75% which means you will earn $75. Another trader places a $100 trade and records a loss. On those two trades the broker made $25. Stay away from those brokers. There is only a handful of quality binary option brokers in the market. I agree with your example. 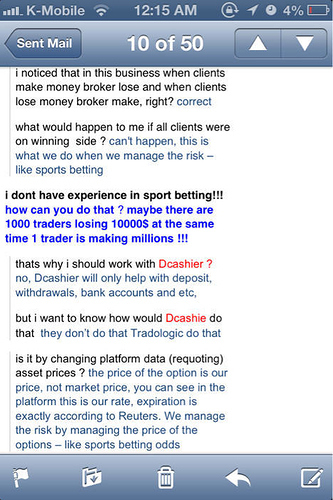 Based on this, how can even an honest broker make money if his clients are good traders ? Is binary options based on the same concept as casino ? No, they are nothing like casinos. I think the big binary option brokers have liquidity agreements with bigger exchanges. I could be wrong. As a trader I believe in hard work and a trader doesn’t just make it overnight. If you intend to trade binary, keep in mind that the house never looses. There was another thread about someone doing binary trading and based on the numbers he gave, it seems like gambling. Said that if you won you received 170%, if you lost you got 15% back. 70 win vs 85 loss so 15% edge for the broker, based on a 50/50 outcome in that scenario. No, it is not all about betting. I have been ‘trading’ them. You just need to understand how to trade them. Most people think forex trading is betting simply because they do not grasp how to trade successfully. I do agree that the advertisement are very misleading and nothing but lousy sales pitches. Hi, why would I do that? You think it is gambling, betting or a rigged game and you are free to think that. I am not here to share my strategies with anyone. I am here to give my opinion and offer general help where I feel it will make a difference. The best I can tell you is that if you think they are too risky for you, then don’t trade them. Well not to upset anyone here but from my experience (testing / demoing a few of them) some time ago: MOST Binary Option Brokers are the FOREX Broker equivalent of a “bucketshop”. You lose: they make. Simple as that. To make matters worse: take a GOOD look at the Binary Option Broker i.e. do a “trace” and you’ll find that they’re nothing more than a “front” for one of only two or three “behind the scenes” BIG Binary Option Brokers or “bucketshops”. Kinda like your FOREX Broker equivalent of a “White Label Partner” (they’re called “Affiliates” if memory serves me correctly). I started a thread around here quite a while ago about these things (look for it if you’re interested). The BIGGEST “move” that they “pull” is to NOT CLOSE (“expire”) the option “dead on time”. MANY times in my testing / demoing did I find, for example, that had the option expired EXACTLY on time I would have been “in the money”. But thanks to the 45-second (at LEAST) delay AFTER the option was supposed to expire I ended up “out of the money”. That type of thing. One would THINK that at very LEAST they’d ensure that you WIN on the DEMO!!! LOL!!! And just you TRY to “call them on it”!!! Good luck with that!!! I also seem to remember somebody working out “mathematically” that the risk/reward ratio and/or “mathematical odds” are not in your favor (I think it’s somewhere on the thread that I mentioned that I started some time back but I could be wrong). ALL of this (the above) being said though: I HAVE noticed that, of late, some “alright” FOREX and CFD brokers are offering Binary Options as well. Hell: there’s even a REGULATED (USA) Binary Option Broker now i.e. “NADEX” if memory serves me correctly!!! Is it “trading”??? It’s debatable ACTUALLY. I mean let’s be honest (and “all things being equal”): how DIFFERENT is it from trading a 15-minute chart with a SL and a TP in place??? Don’t get me wrong. I wouldn’t get “involved” with these things with somebody ELSE’S money LET ALONE mine. But think about it is all. ONE thing that you WILL notice (well that I noticed anyway): a few of the HIGHER PROBABILITY types of Binary Options have been “done away with” e.g. those “Once Touch” Binary Options (well: at the “bucketshop” level anyway). Why??? It’s PRETTY SIMPLE and a NO BRAINER that during a news data release there WILL be a “spike” and of course your “One Touch” Binary Option will immediately expire “in the money”!!! Go figure. Anyway: “each to their own” as they say. Put another way: if they work for YOU then great!!! I have this “argument” ALL of the time (well: at LEAST once per week). Everybody that’s been around here for a while knows that I wouldn’t trade FOREX if you PAID me to do it. I trade only equities and commodities and that works FOR ME (and others that “see the light”)!!! LOL!!! My argument (that could be applied here): WHO CARES WHAT you’re trading just as long as you’re making money. Alright: it does help if you’re trading a particular market where the “odds” are stacked MORE in your favor than another of course. But as I said: “each to their own”. A quote from “Floored The Movie” (a documentary actually): “Always be making money”!!! That about “sums it up” I guess. 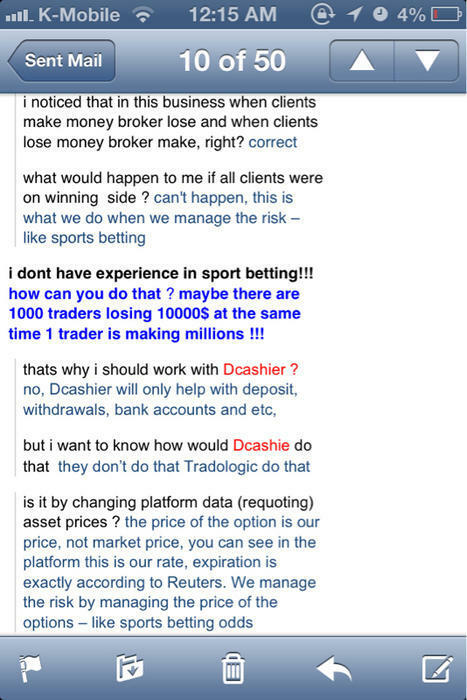 the brokers make money when you lose money this is the naked true!!! Sounds like the best approach would be not to lose money. Most people will fail at that, but it is NOT the brokers fault! Then it simply means that its the gamblers fault…isn’t it? I agree with that. So many blame their brokers for losses. The truth is that most people loses their money because they gamble and not trading. You can make money with binary options if you wait for the right timing and never risk more than you can lose. You do trade against your broker - only one will win, but it’s not a casino - if you are doing your homework and you do wait for the right moment you can earn a lot. The problem is that some brokers will not pay you back even if earned - that’s why you must do a good research before you deposit and always start with a small deposit and try to withdrawal some funds before deposit a large amounts. From my experience the biggest (most famous) binary options brokers are the biggest scams!!! On the broker side it’s pretty much like forex. Some brokers are more reliable than others and you have to do your research. Simple it is based like a casino. The difference here is in a casino the slot machines are set to pay out after so much is paid in. So you can make money if your timing is right on each machine. Card tables on the other hands are different but most of a casino is slots. So it is all betting. In binary options you are correct if you make money your broker looses money so it is not in there best interest for you to win. But you must always remember there is a reason there are so many advertisements out there. For every good trader there are 100 suckers that will more then fill what you make. Therefore regardless of what you make there are 100 suckers paying your tab. Once you start crunching there profits you will be booted. If you got a good broker they will give you your money and kindly ask you to leave. That is the same as a casino. If you make enough for them to notice you get free everything not to leave so you spend your profits there. Trust me they will serve you everything you want to get that money back. If you dont start spending that money and put it in your bags to take home guess what they will see that you go home. In the end it is the same concept but a big difference in the 2. In binary options you see the cards on the table and know your odds. Where in a casino you are playing a slot where it pays in more than it pays out (although you could win big but I doubt it) or your at a table where you dont know what the others are holding. If you get caught counting cards you will be booted. I very much agree with what you said. I do think that if you trade with a good binary option broker, just like trading with a good forex broker, you should have no problems. thanks you all for sharing your opinions. This is very interesting rawand, yes please post more when they answer ! I actually was wrong when at first considered return rates were fixed. The guy from tradologic said they manage the risk by managing the price of their options. Translated to binaries, the parameter they can adjust is the return rate. I looked at it as fixed per broker/per asset/expiration time, but they can (and probably do) change it whenever they want. He just observes amount_bet(i), is_bet_in_the_money_(i) / (out) (=rate at which customers win or lose) and controls the two return rates. If he has enough client, those distributions will likely be gaussian (if not that doesn’t change the problem). He can make the assumption that, let’s say next week bets, will be disttributed the same as what observed until now. If distributions are gaussian (or any symmetrical) he simply use means to calculate what return rate will assure him positive profit. So yes, he not only makes money as long as return rates respect the expected ratio of amounts bet by options winners and losers, but also knows how much he’ll make. Now the other aspect many of us are interested in : what if the rare case of a more-enough-than-average-trader occurs ? The broker will want to know the probability of a one his client winning millions (especially without having the symetric client who lost same millions). That’s just the study of marginal cases. If the distributions are known, you can easily calculate the probality. He may also choose to insure himself against those cases. He may just choose not to be honest and not to pay this lucky client. In conclusion : the broker controls easily how much money he makes out of binaries. Clients making money is then not a problem. BUT the rare client making too much money is a problem for him. The threshold of what if marginal depends on brokers, and it’d be very interesting to learn more about those considered by brokers.